In stock -This product will ship today if ordered within the next 2 hours and 56 minutes. 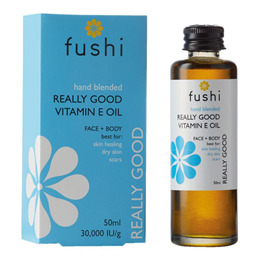 Fushi’s Really Good Vitamin E Oil combines jojoba oil, wheatgerm oil, wild raspberry seed oil and organic orange oil. Best for skin healing, dry skin and scars. Also works as a conditioning treatment for the nails and can help strengthen, heal and repair dry or cracked cuticles. Jojoba oil is a hypoallergenic oil and an ideal moisturiser for the skin. Retaining moisture in the skin will also help your scalp from becoming dry and flakey. It can help decrease environmental damage to your hair and can promote circulation to the scalp. Tocopherol acetate (natural d-alpha tocopherol), Simmondsia chinensis (jojoba) seed oil*, Helianthus annnus (sunflower) seed oil*, Triticum vulgare (wheat) germ oil*, Rubus idaeus (raspberry) seed oil*, Tocopheryl (mixed tocopherols 95%), Citrus sinensis (sweet orange) peel oil, Limonene, Linalool. * Fresh-pressed organic, virgin cold-pressed, fresh from harvest oil. Gently massage into face and body and re-apply as needed. Apply generously to dry skin, blemishes, scars, cuticles, wrinkles, fine lines and stretch marks. Can be added to your favourite skin care product. Apply a patch test before use. Seek advice if on medication or pregnant. 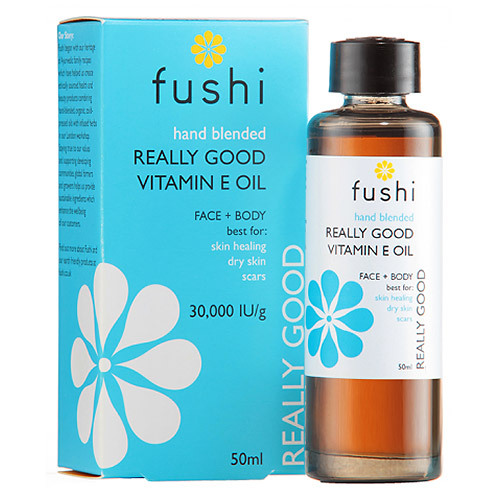 Below are reviews of Fushi Really Good Vitamin E Oil - 50ml by bodykind customers. If you have tried this product we'd love to hear what you think so please leave a review.